This is a hint because it's Friday and there's no better day for letting a little something slip than a Friday. The glominerals facebook fan page is somewhere you are going to want to be. We're launching the first of an exciting (even if we do say so ourselves) promotion at the beginning of next week and we want you to be a part of it. 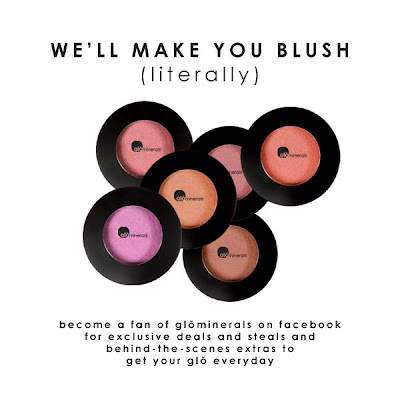 So make your way over and become a fan and you'll be on the inside for all things glominerals. You won't need a because-it's-Friday hint next time because you'll already know. In fact, you'll be able to give your friends hints. So there's even more to score (points with your friends). Plus, there's no better place to be part of the glominerals conversation! And we love to hear what you have to say.